Pick a huge company out of a hat and it wouldn’t be surprising to find that the pay gap between the CEO and the average worker has been widening for decades. But it’s actually average employee earnings across firms — not within them — that accounts for most of the rise in earnings inequality in the U.S. from 1981 to 2013, according to research in The Quarterly Journal of Economics. Here’s another way to think about it: Imagine all the firms in the U.S. lined up in a row. 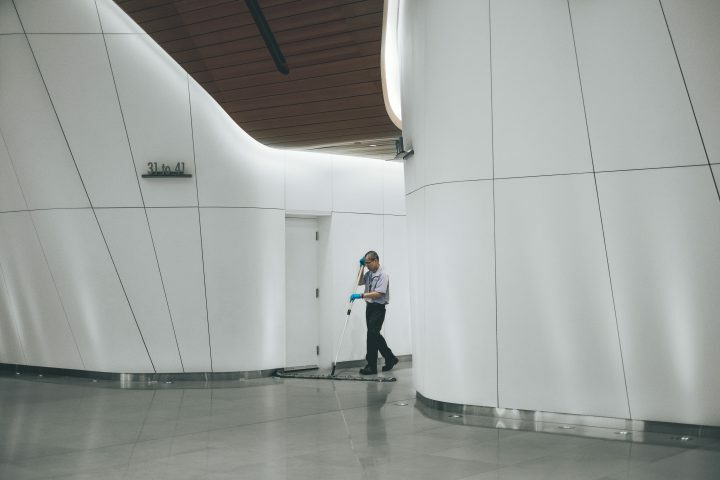 Now arrange them in order of firms that pay the most on average to firms that pay the least — wealth management firms here, office cleaning contractors there. In the early 1980s, the distance between average pay at the highest-paying firms and average pay at the lowest-paying firms would have been relatively small. Today, that distance is much wider. Turns out high-skill employees tend to work with each other, and they’re working in firms that offer high average earnings. This can make for a self-enriching circle for highly skilled, highly paid employees in firms that offer good money — leaving lower-skill workers to firms with low average wages. And individual earnings tend to evolve in line with coworkers’ earnings, according to the authors. “There are these high-paying firms pulling away from low-paying firms, and there are different possible stories for why that would happening,” Price said. This research adds to past explorations into inequality in pay and productivity across firms, and it is the first to explore a dataset that includes earnings for almost every worker in the U.S. over three decades. The researchers used a logarithmic—or log—scale in their analysis, so the overall earnings data would be less skewed by super high earners. Data come from the Social Security Administration’s confidential Master Earnings File, which covers everyone in the U.S. with a social security number. The authors sorted individuals’ annual earnings from 1981 to 2013 by employer identification number, to segment the U.S. workforce by firm. The result is a “massive, matched employer-employee database,” the authors write. The researchers excluded workers earning less than about $3,700 per year. Firms were limited to those with more than 20 employees, so data on earnings inequality within firms would remain meaningful. The authors also excluded workers at government agencies and in public and private education. The average dataset for each year included 72.6 million workers across 477,000 firms. Worker sorting and segregation are propelling earnings inequality across firms, according to the authors. Sorting is the idea that more and more high-earners work at firms that, on average, offer high wages. Meanwhile, lower- and higher-paid workers are increasingly likely to work at different firms — that’s worker segregation. Sorting and segregation account for almost the entire increase in average earnings inequality across firms over the period studied. The authors cite similar patterns in every country with available, detailed worker-firm earnings data: Brazil, Germany, Sweden, Japan and the United Kingdom. Outsourcing tasks like cleaning, catering and human resources is one reason the authors offer for why earnings inequality within firms is not as high as earnings inequality across firms. A financial analyst and a janitor might work in the same building, but their paychecks probably come from different firms. “For whatever reason, firms seem to be becoming more homogeneous,” Price said. The authors consider that technological advances may affect pay averages across firms. Some industries, such as telecommunications, naturally attract workers who draw higher wages as technologies develop and firms expect new skills. Yet even within industries there were average pay disparities across firms. It’s easy to find stories about soaring CEO-to-average-employee pay gaps. This research presents evidence that the pay gap between CEOs and average workers may be a lesser driver of national earnings inequality, but that pay differential can still be vast. Within firms, two-thirds of the widening inequality came from mega firms — those with more than 10,000 employees. Over the study period, the log earnings gap between top- and median-earners widened by 155 percent at mega firms but just 11 percent at smaller firms, “a strikingly large difference,” the authors write. Median log earnings rose 31 percent at smaller firms, while they fell 7 percent at mega firms. But from 1981 to 2013, high earners accounted for just 3 percent of the rise in log earnings inequality at mega firms. That’s because top-50 earners make up only 35,000 of the 20 million employees at mega firms. Widening the pool to include the top 10 percent of earners at mega firms accounts for nearly half — 46 percent — of the rise, according to the authors. Low-wage workers seem to have lost access to good jobs at firms that offer high average wages. Firms provide health care and retirement savings for many Americans, “so rising worker segregation could very well spill into rising health care and retirement inequality,” they write. Workers gain experience faster when they have high-skill colleagues, and a lack of work experience can stunt earnings growth. Over the past 30 or so years, income and life expectancy have become more strongly correlated, where life expectancy tends to increase and decrease along with income. Several other pieces of research point to policy questions related to earnings inequality. Inequality can hinder economic development, particularly in advanced economies. Research has also shown that as inequality rises, inter-generational poverty is exacerbated for those with parents who have low education levels—less than upper secondary. Other research has linked inequality to violent crime. The Organization for Economic Cooperation and Development, a global intergovernmental economic forum, has suggested that policymakers can help reduce earnings inequality through education strategies that promote equal access, and through progressive tax rates. Barth, Erling, et al. Journal of Labor Economics, April 2016. The authors combine U.S. Census and other data and also find that recent increases in earnings inequality stem from differences in average earnings at firms. Abowd, John; et al. Journal of Labor Economics, January 2018. The authors analyze a decade of data and find that across all skill types there are benefits of working for top-paying firms. And it’s not just about higher earnings. Working for top-paying firms also improves the probability of upward economic mobility. Smith, Matthew, et al. National Bureau of Economic Research Working Paper Series, April 2019. The authors explore the importance of human capital for top earners. Human capital may include a person’s professional and personal network, their reputation and their ability to recruit talent. They find that top earners get most of their income because of their human capital. Bell, Alex; et al. The Quarterly Journal of Economics, November 2018. Are there “lost Einsteins” out there? The authors examine a database of 1.2 million inventors and find that children from top-1-percent-earning families are 10 times as likely to become inventors compared to children from below-median income families. National Academies of Sciences, Engineering, and Medicine, 2015. Comparing people born in 1930 to people born in 1960, life expectancy rises for higher earners while for lower earners life expectancy increases less — or even declines. The authors conclude that inequality in life expectancy is rising, concurrent to rising income inequality. “Income inequality, USA, 1913-2014” from the World Inequality Database.